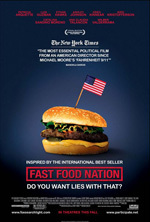 What did you think of Fast Food Nation? My movie ticket to Fast Food Nation was $9.50. The book cost me $12.95. Spend that extra $3.45 on the book. This ensemble movie aims to recreate Eric Schlosser’s 2001 expose on the dark side of American fast food. The movie is not so much a recreation of Schlosser’s writing as it draws inspiration from it. There is no main narrator to give any consistency or coherence to the characters. Instead, we are presented with three main scenarios centered around the small town of Cody, Colorado, and left to connect the dots. First there is the voyage of Raul, Sylvia, and Coco from Mexico into the US, and their emergence into the American economy as illegal immigrants working at a meat processing plant. Then, we follow Don Anderson as the VP of marketing at Mickey?s fast food through his attempt to uncover a health quality issue at the meat plant. Finally, there is 17-year old Amber who works at Mickey’s fast food slinging hamburgers to help her mother pay the electric bill. What do these characters have in common? They are all a part of the fast food nation that America has become. And that?s pretty much it. Schlosser?s book was a work of investigative journalism. He dove into the underbelly of society who are forced to work minimum wage jobs, and explored the consequences of such a life for the future of society. The last 70 pages of his book are notes and references – not exactly a book calling out to be made into a movie. However, it’s the message behind the movie that is important, one that is buried under many too issues. For example: The tiresome and underdeveloped characters. Showing what we already know (or should know) about young, underpaid employees of fast food restaurants and expecting a shocked reaction. The overuse of idealistic speeches about: the ethical treatment of animals, drug use in America, the quandary of the rancher, blue collared worker, illegal immigrant, and teenager without a scholarship. At times I thought I was watching a very long public service announcement. So, message aside, let’s talk about the acting. This is a large ensemble cast: Wilmer Valderrama, Catalina Sandino Moreno, Greg Kinnear, Bobby Cannavale, Ashley Johnson, Patricia Arquette, Ethan Hawke, Bruce Willis, Avril Lavigne. The list goes on, but these are the ones who gain the most lecture time. The only true stand out here is Bobby Cannavale. He plays Mike, a meat plant supervisor, who helps Mexican immigrants get jobs, apartments, and drugs – often in exchange for sexual favors. His acting here is outstanding. He becomes his seedy character, and doesn’t seem to be preaching messages about the impending downfall of America. Perhaps because Mike is the ultimate example of it, but Cannavale’s movement on the screen is the most natural. Also notable is Ashley Johnson, who plays young Amber. She shows the teenager with hope that Schlosser writes about, and offers a frustrated innocence to this bloody movie. Oh yes, it’s bloody. This movie is not for the faint of heart. Severed body parts, animal carcasses, and young teens dying in the desert. More expected in a horror movie, but these scenes shown in the last twenty minutes of the movie are a greater public service announcement than the rantings of Ethan Hawke, Bruce Willis, or Avril Lavigne combined. The movie does get its horrific message across, but the price is most likely tomorrow’s lunch as it won?t be at a fast food restaurant. And maybe that?s a good thing.